Southeastern Grocers, Inc. (SEG), parent company and home of BI-LO, Fresco y Más, Harveys Supermarket and Winn-Dixie grocery stores, has partnered with the American Heart Association and other companies across the country to participate in the American Heart Association’s fundraising campaign; Life Is Why We Give™. 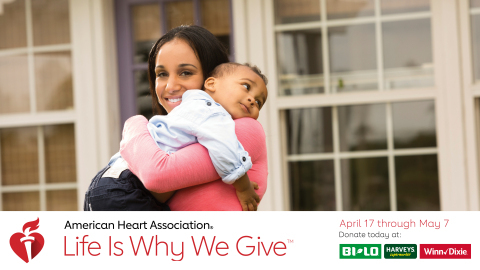 Now through May 5, BI-LO, Harveys and Winn-Dixie customers can help support American Heart Association by donating at the register. Each dollar raised will help pave the way for the next generation of advancements in preventing heart disease and stroke. Southeastern Grocers hopes to empower customers to take control of their own health and encourage healthy habits in others by increasing the awareness of heart disease and stroke, the No. 1 and No. 5 killers of Americans, according to the American Heart Association. The grocer plans to share stories of survival and facts about heart disease and stroke, and encourages customers to learn their numbers with a free blood pressure reading in all BI-LO, Harveys and Winn-Dixie pharmacies. To learn more about American Heart Association promotions and special Life Is Why We Give™ events, please visit www.heart.org/lifeiswhywegive. Donations can also be made directly to the American Heart Association by visiting www.lifeiswhy.org/donate. Donations will help benefit research, public education and community health initiatives of the American Heart Association and the American Stroke Association. Southeastern Grocers, Inc. (SEG), parent company and home of BI-LO, Fresco y Más, Harveys Supermarket and Winn-Dixie grocery stores, is one of the largest conventional supermarket companies in the U.S. SEG grocery stores, liquor stores and in-store pharmacies serve communities throughout the seven southeastern states of Alabama, Florida, Georgia, Louisiana, Mississippi, North Carolina and South Carolina. BI-LO, Fresco y Más, Harveys Supermarket and Winn-Dixie are well-known and well-respected regional brands with deep heritages, strong neighborhood ties, proud histories of giving back, talented and caring associates and strong commitments to providing the best possible quality and value to customers. For more information, visit www.bi-lo.com, www.frescoymas.com, www.harveyssupermarkets.com and www.winndixie.com. In February, the American Heart Association is urging Americans to unite in support of healthy living and the American Heart Association by participating in campaigns led by supporters around the country – including making a donation at participating retailers, purchasing specialty products to benefit the AHA, attending fundraising events and more. Life Is Why We Give allows consumers to think about their reasons to live healthier, longer lives and to give in honor of those reasons. Too long, heart disease and stroke have stolen our precious moments. In February, we fight back together and affirm that we’re more powerful than these diseases because everyone has a reason to live a longer, healthier life and that reason is why we give. More From BioPortfolio on "Southeastern Grocers Joins the American Heart Association to Build Healthier Lives"